Image recognition is a hot area of research using artificial intelligence, and now IBM offers an online demo to let anyone test out the capabilities offered by its Watson cognitive computing system. Six sample photos are provided for illustration, or you can upload your own and ask Watson to analyze them. Either way, the cognitive system will produce a series of "classifiers" offering descriptions of the image's contents along with confidence scores for each of them. 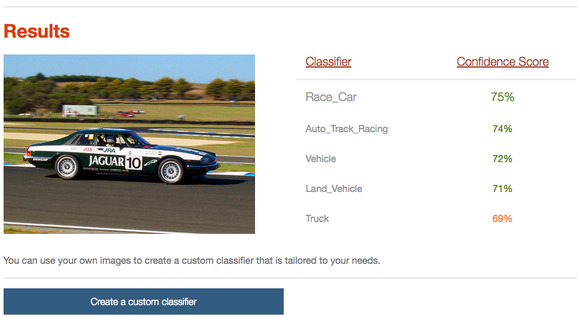 You can also create custom classifiers tailored for specific purposes. Watson gained worldwide fame when it won on the quiz show Jeopardy back in 2011, and IBM has been developing commercial applications ever since. Now in beta, the visual-recognition technology is available to developers to use in their own applications via an application programming interface (API) that was announced late last month. Many approaches to image analysis require users to describe and tag visual content manually, but IBM's service automatically annotates images based on visual content alone, the company says. Essentially, it uses semantic classifiers built with machine-learning technology to recognize objects, settings and events based on content such as color, texture, shape and edges. Based on the IBM Multimedia Analysis and Retrieval System, or IMARS, the visual-recognition service also allows developers to train Watson around custom classifiers for images and build apps that visually identify unique concepts and ideas. A retailer, for example, might create a tag specific to a particular style of pants so it can identify when an image of someone wearing them appears in social media. Image recognition is also a key part of Hewlett Packard Enterprise's newly announced Haven OnDemand "machine learning as a service" collection of APIs. Late last year, MIT’s Computer Science and Artificial Intelligence Laboratory (CSAIL) announced related technology. IBM's visual-recognition service is currently being used by shipping-intelligence company MP Maritime to identify large ships from satellite images. It's available through the IBM Watson Developer Cloud on Bluemix.